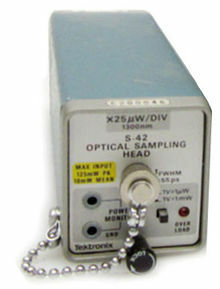 The Tektronix S-42 is a sampling head for 1300 nm optical signals. It has an FC/PC fiberoptic connector for the input signal. It is essentially an S-4 sampling head with a photodiode at the input. Specified accuracy is for connections through 8/125 micron single-mode fibre, although a lens in front of the photodiode allows connections using multi-mode fibre as well, at some degradation of response speed. The manual shows it being used in a 7S12-driven TDR setup with an external OT503 electro-optic converter as the optical signal source. The S-42 borrows heavily from the S-4 sampling head, re-using the S-4 strobe, sampler and preamp boards. It uses the same six-diode traveling-wave sampling gate, strobed by 125 ps pulses generated using a snap-off diode driven by an avalanche transistor. The S-4's SMA input connector is still present internally, and driven electrically in some of the calibration procedures, with the photodiode removed. To accommodate the photo diode, the S-42's case is longer than the S-4's. When inserted, the S-42 therefore protrudes from the base unit by about two centimeters. This page was last edited on 4 March 2019, at 09:25.